Carbon black is a pure elemental carbon which is in the form of fine or aggregate particles that are formed by incomplete combustion or decomposition of hydrocarbons under controlled temperature and pressure. Furnace black, thermal black, acetylene black, and gas black are major types of carbon black. Furnace black is most commonly produced by using heavy aromatic oils as feedstock. Carbon black is employed in a wide range of materials in order to enhance their performance in terms of physical, electric, and optical properties. Carbon black contains more than 95% of carbon and negligible quantities of oxygen, hydrogen, and nitrogen. It is typically manufactured in the form of fine or aggregate particles that are formed by incomplete combustion or decomposition of hydrocarbons under controlled temperature and pressure. More than 90% of carbon black produced worldwide is primarily used as a reinforcement and performance agent in rubber products. In rubber compound materials, carbon black is blended with natural and synthetic elastomers along with various processing oils and then, it is heated to produce various rubber products. Due its ability to provide better reinforcement and improved resilience, tear strength, conductivity, and other physical properties; carbon black is well-recognized as a rubber-reinforcing agent in the tire manufacturing industry. Carbon black is employed in treads, sidewalls, and inner liners; non-tire applications such as mechanical rubber goods (MRG) including industrial rubber goods, membrane roofing, automotive rubber parts (for example, sealing systems, hoses, and anti-vibration parts); and general rubber goods such as hoses, belts, gaskets, and seals. Apart from rubber applications, carbon black is used in specialty sectors such as paints & coatings and inks & pigments. When used as a pigment and additive, carbon black enhances the material performance in terms of conductivity, viscosity, static charge control, and UV protection. This particular grade is known as specialty carbon black. In the paints & coatings industry, carbon black is used in jet black paints in the form of treated fine particles. Several end-use industries such as automotive require black pigments with the maximum jetness and bluish undertones. The global carbon black market is anticipated to expand at a CAGR more than 4% from 2018 to 2026 and reach value of US$ 23.9 Bn by 2026. In 2016, the reinforced grade segment held a major market share of more than 65%, in terms of both volume and value. Specialty grade is the rapidly expanding segment of the market for carbon black. It is driven by the rising demand from the industrial manufacturing sector. Increasing demand for specialty-grade carbon black for use as a pigment in coatings, plastics, and other industries has prompted leading carbon black manufacturers to increase their production capacity for specialty–grade carbon black. Volatility in prices of raw materials (such as carbon black oil and carbon black feedstock) and hazardous gases emitted into the atmosphere during the manufacture of carbon black are major restraining factors for the global carbon black market. The external substitution of carbon black by other materials such as precipitated silica or nano silica is another restraint of the carbon black market. 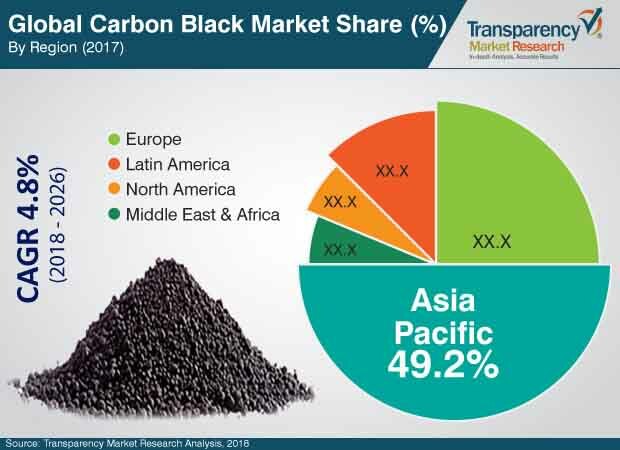 Asia Pacific held the leading share of more than 50% of the global carbon black market, in terms of volume, in 2017. China is a major producer of carbon black with a few major producers operating in the market in the country along with several small and inefficient manufacturers. India is a major country importing carbon black from China. In Asia Pacific, a majority of the demand for carbon black comes from China and India, due to the expanding tire manufacturing industry and the construction sector in these countries. There exists high supply shortage due to the Government of China’s regulations on operating inefficient plants, which has led to massive shutdowns in the country. Hence, China’s utilization rate of carbon black is below the global average utilization rate of carbon black. Asia Pacific is estimated to maintain its dominance in the global market throughout the forecast period, with shifting of production base by tire manufacturers to developing countries in the region. The market share of North America, Europe, and Asia Pacific is expected to increase at a rapid pace, while the market share of Latin America and Middle East & Africa is expected to increase at a sluggish pace between 2018 and 2026. Around 65% of the global carbon black market is consolidated, while the rest is fragmented with a few small players operating in the market. Key players operating in the market are Cabot Corporation, Orion Engineered Carbons, Birla Carbon, Continental Carbon Company, Tokai Carbon Co. Ltd., and Philips Carbon Black Ltd. Other players include Pyrolyx AG, Nippon Steel & Sumikin Chemical Co., Ltd., Shandon Huadong Rubber Materials Co., Ltd., Black Bear Carbon BV, Mitsubishi Chemical Corporation, Imerys Carbon & Graphite, OMSK Carbon Group, Longxing Chemical Group, and ASHAHI CARBON CO., LTD. Market players have been profiled in terms of attributes such as company overview, financial overview, business strategies, and recent developments. The report also comprises a matrix of comparison between the top four players operating in the global carbon black market along with analysis of their market shares in 2017. The report also analyzes price trends and forecasts prices of carbon black at the global and regional levels. The report further includes import–export trade analysis in terms of value (US$ Thousand) and volume (tons) for the period from 2013 to 2017 to better understand the supply–demand scenario at the regional and country levels. The report includes detailed value chain analysis, which provides a comprehensive view of the global carbon black market. Porter’s Five Forces model for the carbon black market has also been included to help understand the competition landscape of the market. The study encompasses market attractiveness analysis, wherein grade and end-user industry segments have been benchmarked based on their market value, growth rate, and general attractiveness.